There’s typically a ton of hype surrounding new WordPress releases, and WordPress 3.0 certainly won’t be short of people singing its praises. This upcoming release might even have more hype than usual because the sheer number of new features will be overwhelming. When WordPress 3.0 is released, it’ll mark the release of several things I’ve been waiting for in the last couple of years. It’ll be at a point where it can be molded to create any type of website. If I were to dub this release anything it’d be WordPress: Custom. I consider myself an ideas person. I can sit for hours just playing around with WordPress and trying to make it do different things for fun. There are some things I’ve wished I could do for a long time just with my blog here, but the system hadn’t quite reached that point. Not that some of those things were impossible. They simply weren’t worth the time and effort. WordPress 3.0 removes a barrier that’s been in place for a long time: the ability to create our sites on our own terms. No longer will you be bound to terms like “post” and “page” or “tag” and “category.” You’ll be able to simply create a site and call things what you want. Custom post types and taxonomies aren’t the only thing to be excited about. WordPress 3.0 will offer a slew of new features for both developers and end users. As usual, I’m lining up some tutorials for the next release. But, I’m going to let you pick which tutorials you’re most interested in this time around (you can probably tell what I’m most excited about). Below is a list of features that I’m interested in and would be willing to write about. Custom post types These allow you to create any post/content type you like, set with permalinks, admin pages, and all the works. You can go as simple as what I’m planning for my home page or as complex as something like a bug and issue tracker. Custom taxonomies I’ve previously written on custom taxonomies, but there’s a ton of new features coming along like hierarchical taxonomies and taxonomies for any post type. Custom post statuses By default, we have a few different statuses we can set our posts to. In 3.0, we can create new post statuses to use within our projects. Right now, this probably still needs some more work. Navigation menus The day will finally come when you no longer have to climb mountains to get the navigation you want. You’ll have a simple click, drag, and drop interface to create custom menus. Editor stylesheets Themes will be able to package a stylesheet for the post editor that matches the look and feel of their theme content areas. Shortlinks Don’t like posting long URLs on site’s like Twitter? 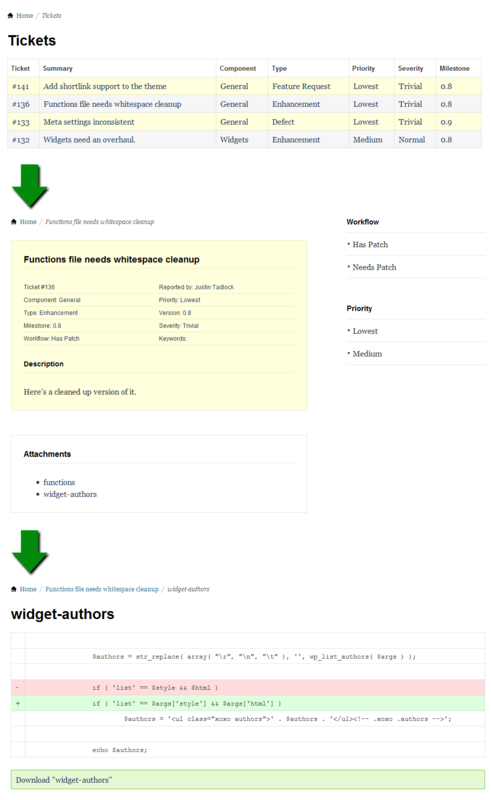 A new shortlink function (that can be enhanced by plugins) will be packaged in. Custom headers and backgrounds Custom headers have been around for a while, but the feature is getting an upgrade. And, the ability for theme devs to allow users to have a custom background will be included. Standardized comment form One of the things that’s always bugged me is that it has been hard for plugin authors to add extra functionality to a theme’s comment form. This feature will open several doors for cool plugins. Login form You won’t have to use a hacked up login form of your own anymore. WordPress will have a function for outputting this and allow your users to log in easily. And, I can think of a few things that could make this valuable for plugin authors. User meta functions Like our post meta functions, we’ll be getting a equal set of easy-to-use user meta functions that allow us to update user metadata. get_generic_template() function This will allow you to properly load special templates outside of the WordPress templating system. home_url() and site_url() Two new, much-needed functions for appropriately displaying the URL of pages. No, I haven’t listed all the features coming, just the ones I’m most interested in. I’ll leave things like the WordPress and WPMU merge for people more knowledgeable about MU. So, take your pick. What are you the most interested in learning about? I also hope this provides some of you a chance to get some of your questions in, so I’ll know to cover them in the tutorials.